A cooking challenge organized by Meg of Grow and Resist and Briggs of Oh Briggsy in which we explore a featured cookbook each month. The selection for October is Marcella Hazan’s Essentials of Classic Italian Cooking. I did not learn to cook in my mother’s kitchen. I learned in her library. In addition to being an avid reader of fiction, my mom collected cookbooks and may even have belonged to a cookbook-of-the-month club. She subscribed to a bunch of shelter magazines and regularly bought pamphlets at the grocery store, all of which I eagerly awaited as a kid. From an early age, I got the run of a pretty well stocked assortment of topics and recipes and food lore. Instead of confiscating books when I moved away, I spent time carefully duplicating the best parts of my mother’s collection, sometimes buying them new and sometimes combing flea markets and book sales for out-of-print volumes. Of course, Julia Child’s Mastering the Art of French Cooking was right at the top of the list, and I found myself systematically cooking my way through it. The same was true of Marcella Hazan’s The Classic Italian Cookbook (1973) and More Classic Italian Cooking (1978). I did not bother to acquire Essentials of Classic Italian Cooking since I thought it is basically a rewrite of the first two volumes (more on that in a minute). However, my husband decided to buy it for my iPad, which was great since I spent a lot of time traveling this month. I read the iPad on the plane and the books in the kitchen. It was like becoming re-acquainted with a friend I hadn’t seen since college, which was especially poignant since she passed away just as we started cooking her books again. I knew that Marcella’s books underpinned the way I cook now, but I had no idea how much. Some of my most successful techniques come from Marcella: roast chicken with two lemons, pork braised in milk, veal stew, bagna cauda, frittata, homemade pasta and extraordinary sauces to accompany them, smothered cabbage…. Among the salads and vegetables and soups in the book, there are many that I make all the time without realizing that they were possibly inspired by my early immersive and exhaustive experience cooking these books. I love the simplicity of techniques and ingredients of Marcella’s cuisine. Chicken roasted with two lemons is a classic. 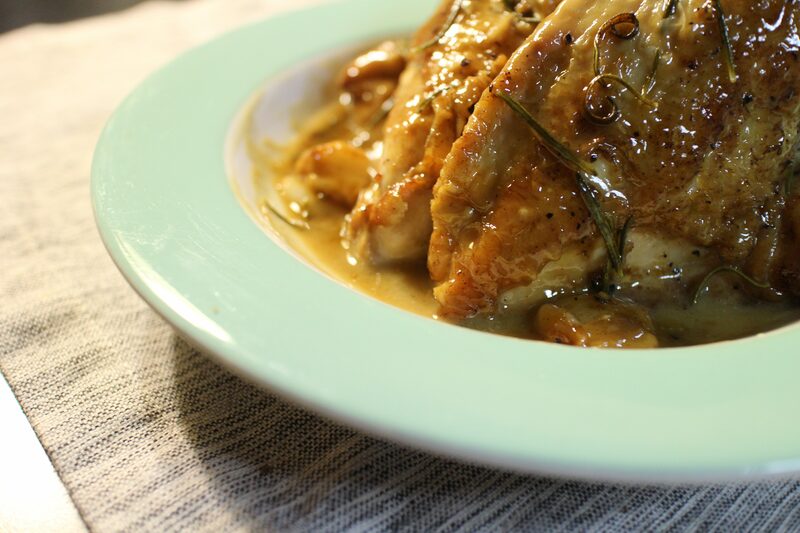 This month, we particularly enjoyed the similarly simple Pan-roasted Chicken with Rosemary, Garlic and White Wine (Page 304 in Classic), which is repeated in Essentials minus a tablespoon of butter. I was a little puzzled by the bluefish baked on top of crispy potatoes since that’s something we make frequently at our house (sometimes topped with tomatoes). 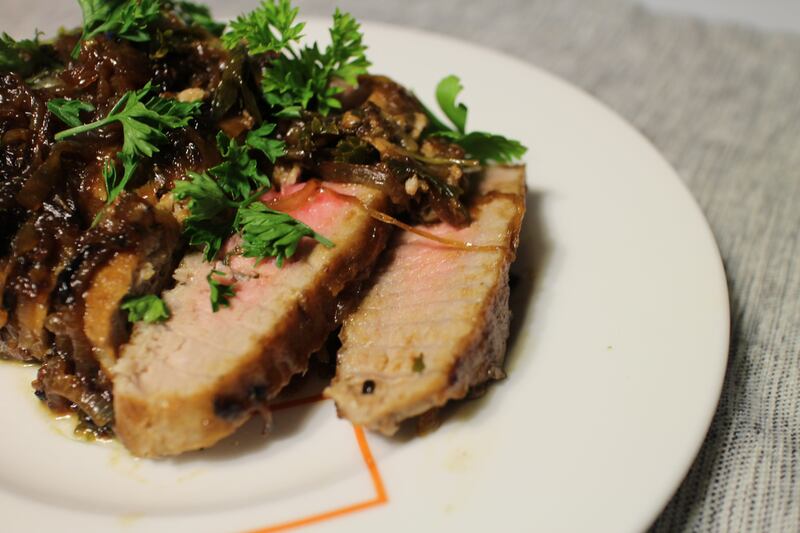 However, Marcella’s recipe was not annotated with dates and comments so I may have gotten the idea elsewhere. 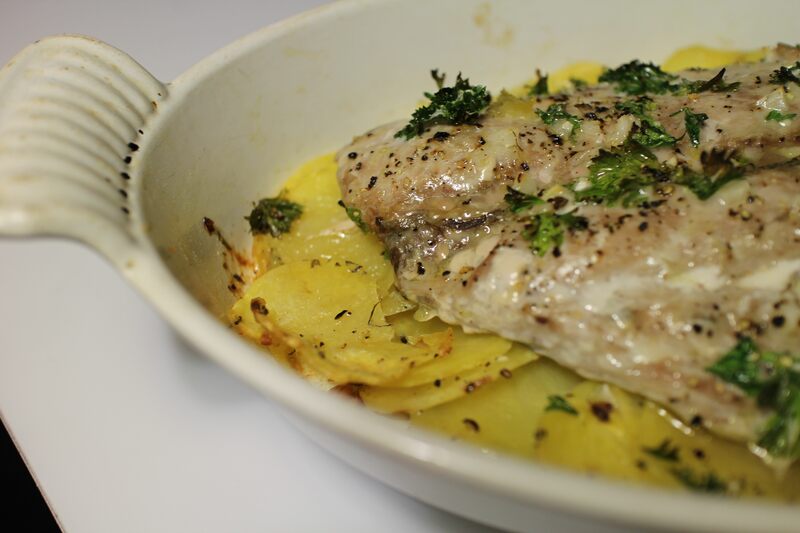 Baked Bluefish with Potatoes, Genoese Style (Pages 208-210 in More Classic), which became Baked Bluefish Fillets with Potatoes, Garlic, and Olive Oil in Essentials, minus a few tablespoons of olive oil, was baked at 450 degrees, a higher temperature than I usually use. The potatoes crisped beautifully and contrasted perfectly with the slightly strong, juicy fish. Leave it to Marcella to get this just right. Reducing the oil was the right idea. On the fish topic, Sweet and Sour Tuna Steaks, Trapani Style (pages 221-222 in More Classic) kept its original name in Essentials but lost some olive oil (this is starting to be a theme). I am a big fan of Italian agrodolce, and this did not disappoint, taking a rich fish and sparking it with sugar and vinegar. I could not locate Steamed Fish between Two Plates (Pages 218-219 in More Classic) in Essentials so it must have been dropped. Too bad, since it’s something I might not have attempted if I weren’t so fixated on the simplicity of Marcella’s techniques. You place thinly sliced swordfish on a dinner plate over a saucepan, cover it with a pot lid and let it steam in its own juices. Wow. 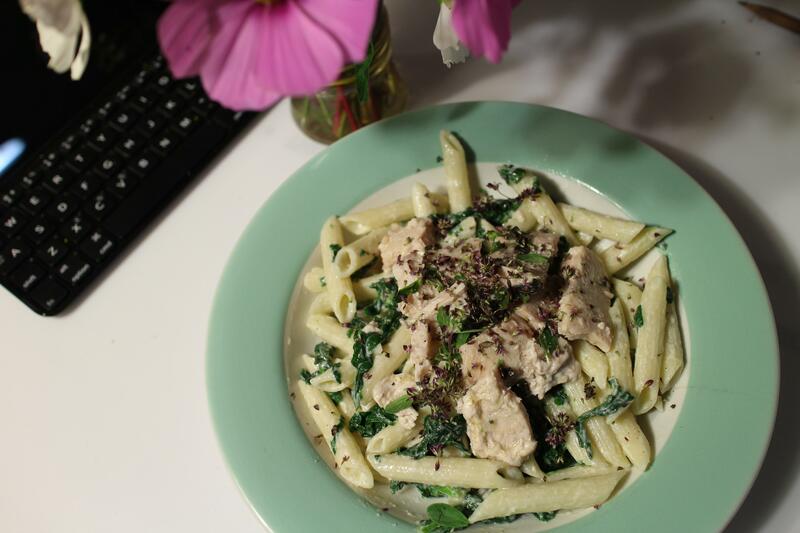 Marcella recommends that the fish be accompanied by chopped parley and cornichons, which I do recommend, but I was serving it with Penne with Ricotta and Spinach Sauce (Pages 147-148 in More Classic, where in Essentials?? ), so I omitted the pickles. 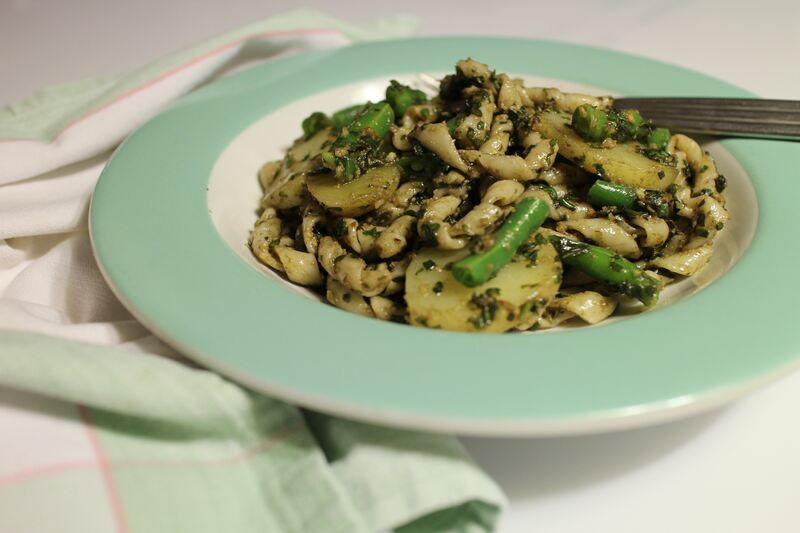 Other than the bluefish, which was an all-around favorite with the whole family, Pasta and Pesto with Potatoes and Green Beans (Essentials) was the biggest hit. With frost approaching, I was using up the maximum amount of Genovese basil in our garden as quickly as possible. We had wonderful twisted fettuccini-wide noodles, hand-carried from Italy, which were a terrific textural foil to the unctuous pesto, crispy beans and soft potatoes. This one was memorable. 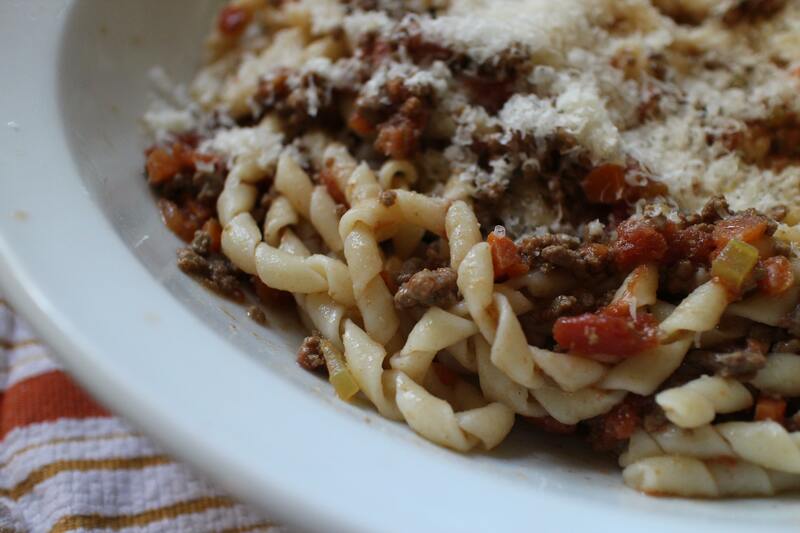 Of course, I had to make Bolognese Sauce (Page 127-128 in Classic), the recipe that I make once a year at least. We served it simply with spaghetti. 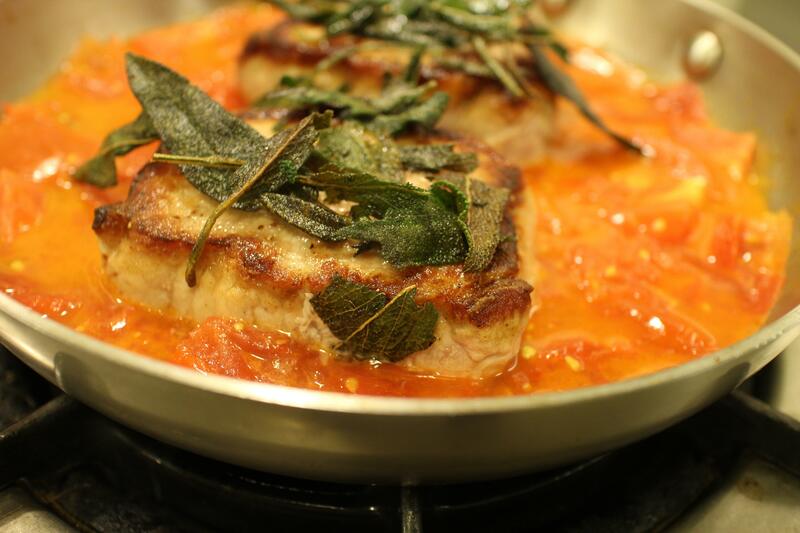 Not to mention Braised Pork Chops with Sage and Tomatoes, Modena Style (Pages 293-4 in More Classic). One of my all-time favorite soups from Marcella Hazan is Red Cabbage Soup, from Classic, made with sausage and white beans. (I think I’ve blogged about this before). 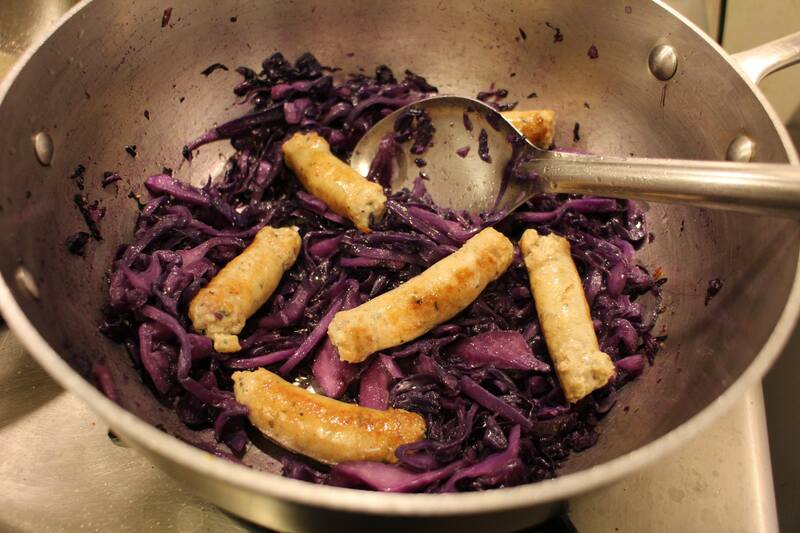 This time, I made a whole-meal version, Sausages with Red Cabbage (Pages 302-303 in More Classic) but didn’t find it in Essentials either. We ended our meals with Marcella’s simple and elegant salads and desserts. 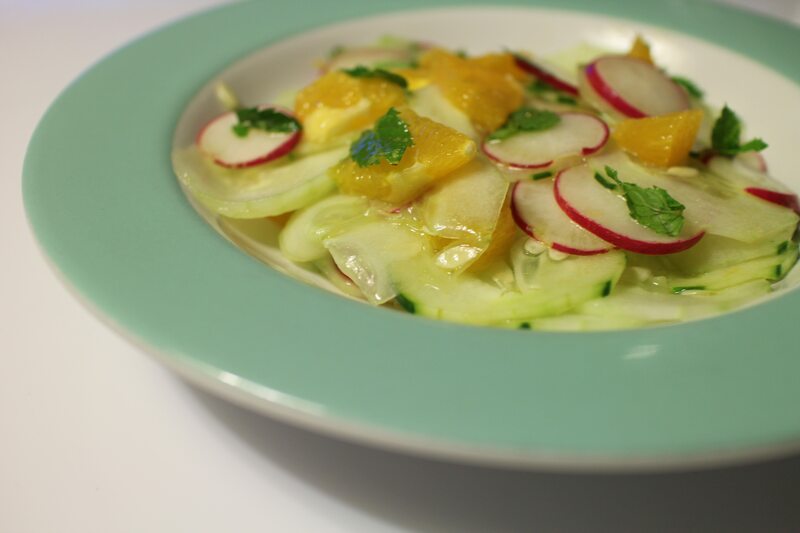 We enjoyed Orange and Cucumber Salad (Pages 414-415 in More Classic) and Radicchio and Warm Bean Salad (so-named in Essentials, formerly called Endive and Cranberry Bean Salad, Pages 415-416 in More Classic). The latter has an interesting story that tells us something about cooking over the past 40 years. Marcella’s original recipe called for fresh cranberry beans, which she assumed were available, but substituted Belgian endive for long Treviso radicchio, which she assumed was not. 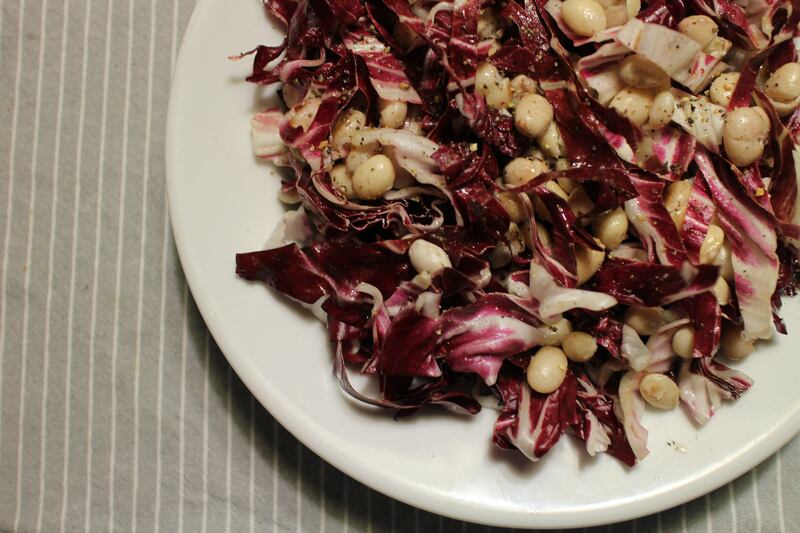 In Essentials, she switched them, allowing dried beans for fresh and taking radicchio as a given. With a head of radicchio (not the long Treviso) from our CSA this week, and fresh cranberry beans from the farmers market, I was in heaven. This could be one of our new favorite salads. 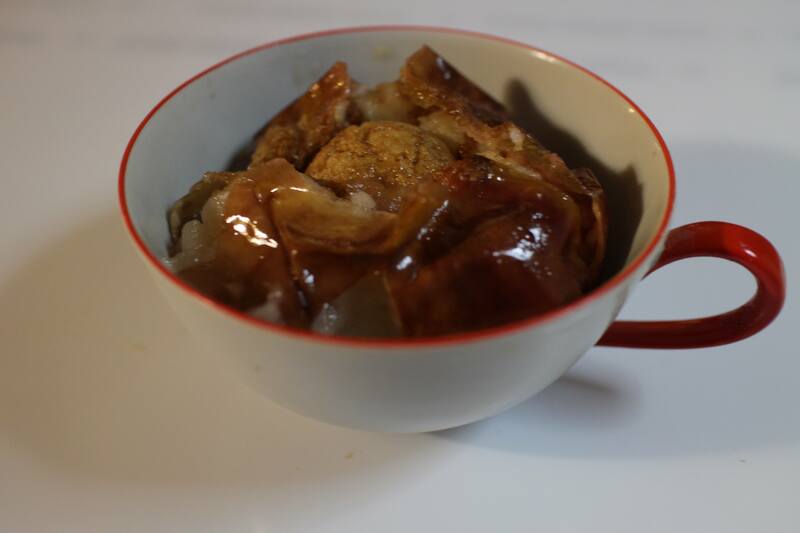 Finally, we made Apples baked with Macaroons (Pages 441-442 in More Classic), a simple hollowing out of apples stuffed with crushed cookies and butter and baked in white wine. Delectable and a perfect finish to a great cooking adventure. In her earlier books, Marcella gives the Italian name of the recipe first and then the translation, along with menu suggestions. Of course, we knew that she wrote in Italian and her husband Victor translated. The writing in Essentials – very well edited by Judith Jones — transforms the original books from lessons on how the Italians cook and eat to a more polished cookbook attuned to more modern sensibilities (even though it’s now a classic in its own right). The order of the first book corresponds to the menu suggestions: antipasti, first courses, second courses, vegetables and salad, cheese and dessert, and the food would have been more varied and greater than our way of eating today. (Although, when I’ve been in Italy, some of those early courses are more like tapas in volume, and meals can take hours to eat.) The second book adds dishes for single-course meals and buffets, along with pizza. By the time we get to Essentials, the Italian language and menu suggestions are all gone. I miss the rough charm of the originals but I have to commend the very professional effort to brush off an old classic and make a new one. I too obtained my own copy of Mastering the Art of French Cooking when I left home. Lovely post.